Comfort Blue Skies Fabric Conditioner 1.26L. Treat your family to the delightful feeling of outdoor ..
Voted No.1 laundry brand for sensitive skin (online panel of 3347 females aged 18-70) Gentle fo..
Farlin Cloth Detergent Clean 2.0 1000ml Natural, non-phosphorus, non-fluorescence, mild and.. It Works Formulated with PlantTech™ for 20% more stain-fighting power* to tackle the broadest range.. Comfort Pure Hypoallergenic Fabric Conditioner 1.26L. Comfort Pure Hypoallergenic Fabric Conditioner.. Comfort Lavender Bloom Fabric Conditioner 1.26L. Treat your family to the delightful feeling of lave..
No.1 for sensitive skin** **Based on AC Nielsen, MAT Comfort Pure promises kindness on the most de..
Our safe + effective (and adorable!) diapers will help keep your baby's sensitive skin protected and.. Laundry detergent0m + Formulated to clean the garments of the little ones.&nb.. Specially designed for cleansing and protecting baby clothes. For clothes as soft as mom's hug!.. 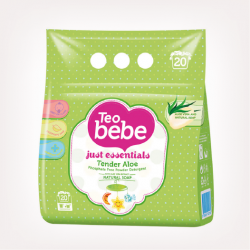 Anti-Bacterial – effectively kills 99.99% of bacteria on baby's clothes Effectively remove stubborn..
Teo bebe Sweet Lavender liquid detergent is specially formulated for washing of baby’s and children’..
Softener Sweet Talcum 750 Ml0m+Gives freshness and softness to all the clothes of the child ..
Super-Concentrated Softener "Flowery Embrace" 750ml For sensitive skin. The unique softener o..
Chicco New Dis-infectant for feeding bottles and teats new Sterilsistem Liquid 1L ..